Japanese Episode DP 009: "Let's Play with Mimirol!?" American Episode 473: "Setting The World On It's Buneary!" lt's a typical morning in the Shinou region as Satoshi and his friends get ready for the day. As Hikari stresses over her bedhead, a wild Mimirol appears in front of our heroes! Hikari and Satoshi both want to catch it, so the two trainers start chasing the rabbit pokemon. When our heroes catch up, Hikari is the first to try. Mimirol uses its Dizzy Punch to knock out Potchama, giving Satoshi a chance to try with his Pikachu. 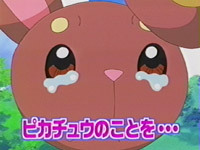 However, Mimirol refuses to battle Satoshi's pokemon! 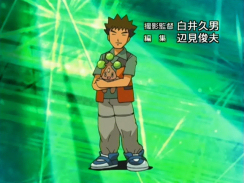 Takeshi and Hikari determine that Mimirol is in love with Pikachu, a concept Satoshi is unable to grasp. Mimirol eventually uses an Ice Beam attack to freeze our heroes before running off with Pikachu! Our heroes stay frozen until they are rescued by Takeshi's Gureggru, allowing them to resume their chase. However, they find that both Mimirol and Pikachu have been kidnapped by the Rocket-Dan! Satoshi helps Pikachu use its Iron Tail to free itself and the rabbit pokemon before they bring the Rocket-Dan's mecha crashing down to earth. At that moment, Junsa appears to arrest the Rocket trio, chasing them out of the forest. Once the chaos has subsided, Mimirol initiates a battle with Hikari! By using a combination of attacks, Hikari's Potchama battles it until it's weak enough to capture. Hikari has officially caught her first pokemon! With a new friend by her side, Hikari looks forward to competing in her very first Pokemon Contest. Aside from the great Gureggru moments, this episode is pretty forgettable even if it does mark Hikari's first pokemon capture ever. Mimirol's infatuation with Pikachu is a nice little subplot, but one of the bad things about keeping up with the Japanese version is that I know that this is something that'll never pan out to anything. I hope PUSA goes back and fixes the title screen because that apostrophe should not be in the word its. They've fixed errors in their title screens before, so hopefully they'll catch this one and correct it as well. This episode also makes me glad that this show is on Cartoon Network because if it was still on Kids' WB!, the promos for their stupid "Pillowhead Hour" would be absolutely plastered with shots of Hikari with her bedhead. In Japan, the shot of Takeshi in the opening theme is updated to include Gureggru. Of course, we won't see any of these neat updates in the US since PUSA scrapped this shot of Takeshi for clips from the first Gym Battle that'll be outdated in another ten episodes or so. The TO BE CONTINUED screen is made longer by three whole seconds.